Young people from four schools in Ealing borough have taken part in an event in which they had to pitch their travel related ideas to a panel of transport experts. They came together at Ealing Town Hall’s council chamber on Wednesday, 25 January to look for ways to encourage more students to walk, cycle or use public transport to get to and from school. 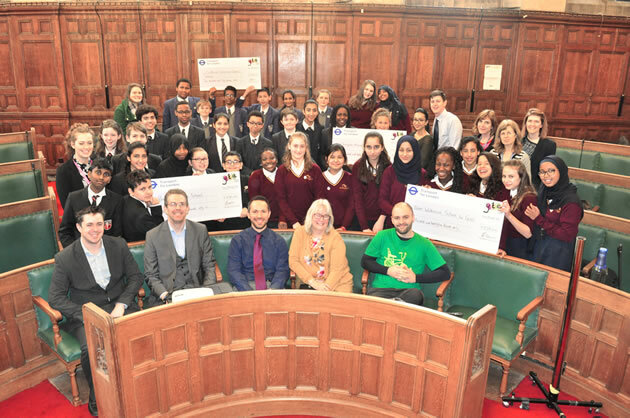 Four schools took part in the in Ealing Town Hall’s council chamber. Funding of up to £250 was available for each school at the Youth Travel Ambassadors Dragon’s Den event. The schools that took part on the day were Brentside High School, Hanwell, Ellen Wilkinson School for Girls, Acton, Cardinal Wiseman Catholic High School, Greenford, and Drayton Manor High School, Hanwell. Some of the ideas that were pitched included providing biker breakfasts and cycle maintenance workshops to encourage more students to cycle to school. There was also a plan for an inter-form walking competition and the production of a film to raise awareness of road safety. Another group of students wanted to run a campaign to reduce anti-social behaviour on public transport and raise awareness of what students can do to if they experience threatening behaviour. All involved using innovative ideas and technology to make the projects happen. All of the students were successful in their bids and will now start to implement their campaigns in their school. Councillor Bassam Mahfouz, cabinet member for transport, environment and leisure, said, “These young people should feel very proud of their achievement. It takes a great deal of courage and commitment to stand up in front of a panel of experts and convince them to fund your idea. Their next step is now to persuade their fellow students to take part and make their projects a success. For more information on sustainable school travel and to find out what local schools are doing to make a difference, go to the STARS website.